both the challenges faced and the actions needed to achieve a healthy global ocean for the future. the sum of its parts; and that it is happening at a much faster rate than previously predicted. Yes, it’s alarming. But instead of turning away, the right response, as with climate change, is to imagine even more radical and deeper changes in the way humans live and do business, and build the grassroots political will to actually make the sacrifices needed to make a difference. No more nibbling around the edges. Time to reinvent humanity, which would not only be good for the planet, it would be good for humanity. The biodiversity of the deep sea is equaled only by that of tropical rain forests, and the destruction of rain forests has long been known to affect biodiversity and the global climate. Similarly the deep sea is home to countless species, including the oldest known living animal and to life-forms found nowhere else. Ninety percent of the ocean is below 200 meters, but not much is known about life in the deep sea; expensive research sampling has been done in about 1 percent of this vast area. Over the years, as fisheries in shallow waters collapsed, the fishing industry began looking to the deep for new species to exploit. Most deep-sea fish have flesh that is not palatable, but a few were found that could be marketed for human consumption, if filleted and renamed to be made more attractive, or for processing into food pellets for poultry. These stocks were readily attacked using trawls large and heavy enough to reach as deep as 2,000 meters, and it took only 10 to 15 years to reduce the fish biomass by about 80 percent. In 2011, vessels from eight E.U. countries landed 15,000 metric tons of four species of marketable deep-sea fish, which represents only 0.4 percent of Europe’s fish haul. Several deep-sea fish species are poorly fertile (2 to 4 juveniles a year for the shark Centrophorus) and others reproduce for the first time when quite old (up to 32 years). Most of them are more biological curiosities than fishing stocks. 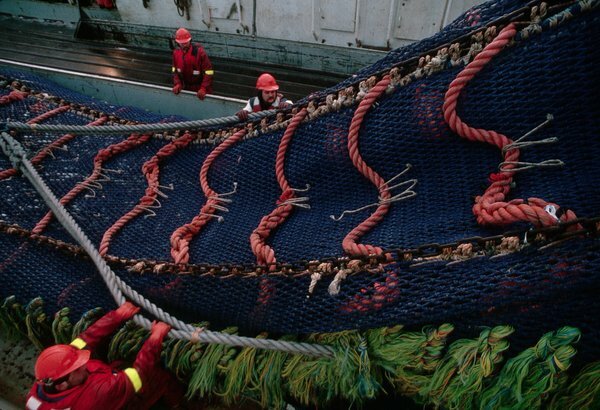 Bottom trawls are not selective; in the Northeast Atlantic alone they catch untold amounts of more than 100 species of fish. Deep-sea bottom communities harbor species that can be large, but are delicate and fragile, such as corals and sponges. Deep-sea corals are not what we are used to seeing in tropical waters, and with a few exceptions they do not build massive reef structures. Instead, many are more akin to trees, sometimes more than three meters high, and sometimes very old, often reaching more than 100 years and occasionally more than 4,000 years. These are smashed by trawl gear. Bottom images of trawled deep-sea areas, and two seamounts I visited with a deep-diving remote vehicle, show that nothing is left standing in the wake of this type of fishing gear. Reinventing humanity means reinventing how we manage the Earth’s resources. Nation states claiming sovereignty over large swathes of coast waters, where they do what they please, and competing relentlessly and ruthlessly with one another to out-compete and out-exploit each other in the vast swathes of the oceans that are not regulated, is a failing model. The oceans need to be treated as a global resource that is managed for the benefit of the oceans and for all of humanity, through the UN or through an international collaboration of likeminded states with the will and tools to impose real consequences on violations. My guess is the best model would be as large a group of likeminded states who would use their economic and political influence to try and create a new set or priorities and regulations related to climate and the oceans. Ridiculous, idea, I know. Never gonna happen. Well, the alternative is increasingly apparent, and it is disastrous. Incrementalism is the same as failure. So why shouldn’t we think in revolutionary terms? What other option is there? Interesting post. We had better start discussing overpopulation in earnest. As long as humans can be counted in billions, all other measure can only be incremental. Thank you for this excellent article. Humans must STOP eating ocean wildlife–we vote with our dollars. And definitely need to address overpopulation as Donachy’s say above.